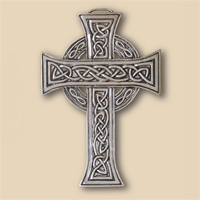 Pewter Gifts with meaning. Celebrating the special people and events in our lives, Wedding, Baptism, New Home. Handcrafted in the USA. Framed Pewter, Wall Plaques, Room Blessings, Ornaments, Labyrinths, Gifts. Faith, Spirituality, and Home. Over 257 years of American Handcraft. A wonderful wedding or anniversary gift, for that perfect couple. 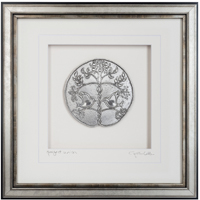 Our framed Perfect Union Wall Plaque is individually signed and titled on the mat by Cynthia. The design is adapted from an Art's & Crafts motif. Frame is 10" X 10" with fine pewter on crème mat under glass, descriptive label and sawtooth hanger on the back. Story card included. Also available in Large Frame. Available in Dark Espresso Wood or Silver finish frame. 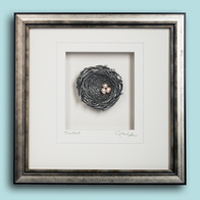 Our Best Selling Medium Framed piece. Our Celtic Cross is one of our best-selling wall plaques. The title is from a Celtic Prayer, design adapted from an image in the Book of Kells. Larger pewter pieces to enrich your world. 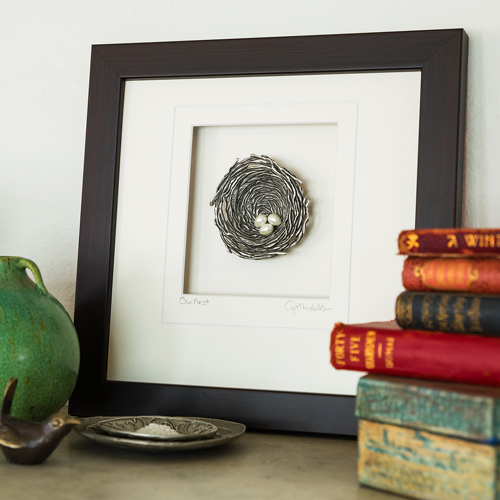 The original is carved in jeweler's wax, signed and titled on the back before the master is cast by Cynthia Webb. Pewter pieces are all hand cast and finished. Each piece comes with hanging ribbon and story card. Also available in Large Frame.